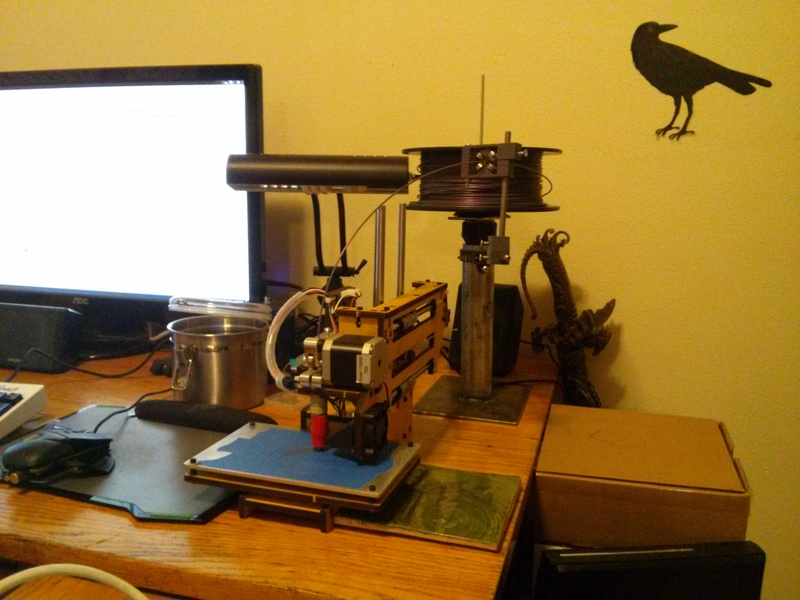 Early this year I purchased a Printrbot simple to have a printer I could keep on my desk at home. I didn’t need anything big, just something for printing pretty things and parts to fix stuff around the apartment so it was a perfect option. While it has been a fantastic printer there was one drawback to it. That is that there is no place for the filament on the base model. There is an upgrade kit for the 2013 model (I am not sure it it works with the 2014 model that I have but I think so) that adds one on top but it was not really what I was looking for since it is only slightly adjustable width wise with some mods. Also I know me and I would knock it over. Using some parts and scrap from around the makerspace along with several printed parts (it is always fun printing parts for a printer on the printer you are printing them for) I designed something that will fit just about any filament spool, holds the spool in such a way that the printer barely has to work to un-spool more, and can be used to keep the printer from spinning off my desk when it decides it wants to start shaking and walking while printing.